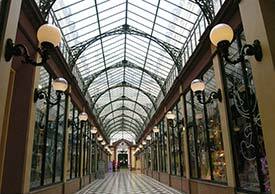 ABOVE: Joué Club's department store for children occupies the historic Passage des Princes in the 2nd arrondissement. Village Joué Club, also known as the Joué Club Village de Paris, is a shopping mecca for children and indulgent parents or grandparents. Although it resembles an upscale downtown mini-mall, it's actually a department store with its various departments laid out as separate shops. The complex, which totals 2,000 square meters or nearly 22,000 square feet, occupies the renovated Passage des Princes, which was built in 1859 during the heyday of glass-roofed Parisian shopping arcades. It's worth visiting for the architecture even if you don't have any children in your life. But be warned: If you're traveling with kids or eager to indulge les enfants, you may find it hard to limit yourself to a quick survey of the colonnaded entrance, glass-roofed shopping arcade, and stained-glass rotunda. The passage and its shops are open from Monday through Saturday from 10 a.m. to 8 p.m.